Nothing makes more tender and flaky pie crust or biscuits than lard. This long ignored fat is experiencing a much deserved renaissance in the culinary world and you should get on the band wagon by rendering your own supply. Start with the highest quality pig fat you can find, preferably leaf lard which has a milder flavor than back fat. Your local neighborhood farmer's market is a great place to source quality leaf lard. 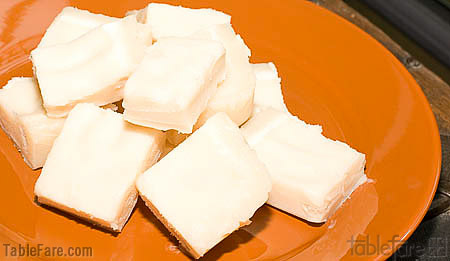 Lard can be rendered in a low temperature oven or over a very low heat on the stove top. 1 pound of fat typically generate 1 - 1 ½ cups of lard. Leaf lard sometimes has a thin membrane surrounding the fat, which can be pulled off and discarded. Back fat may have an outer layer of skin, which can also be discarded or better yet, used to make cracklings. Chop leaf lard or back fat into 1" or smaller pieces. Place the fat in a large heavy-weight pan (cast iron is ideal) and place the pan, uncovered, in the preheated oven. Let the fat render for 3-5 hours stirring after the first 30 minutes and then again every hour. As the fat begins to melt pressing the larger pieces of solid fat against the side of the pan will help move the process along. Once the fat solids begin to turn a golden brown color, remove the pan from the oven and pour the fat through a strainer lined with a double layer of cheesecloth. Squeeze the solids to remove as much of the rendered lard as possible. The fat solids will likely still contain fat to be rendered, and they can be returned to the oven for further rendering. The more color the fat takes on the more of a roasted pork flavor the lard will have. Pouring off the bulk of the fat earlier in the rendering process is a good way to collect a portion of mildly flavored lard and then continue to render the solids so as not to waste any of the fat. The second straining will produce stronger flavored and darker colored lard. Let the lard cool and set. Then portion it as you wish. I like to portion mine out for individual pie crusts and store the pieces well wrapped and clearly labeled in the freezer. Lard will keep fine in the refrigerator for a few months.